Inspired by The Selvage Yard's summery, I have decided to take a critical look at the year taht was 2009. '09 for me was a reinvention of the old and a reintroduction to the new. Primarily I was looking at brands taking past philosophies, and reproducing old ideas faithfully while bringing something new to the table. One brand in my mind did this flawlessly in 2009 and that was Visvim. Hiroki Nakamura really does his research and it shows, from his dissertations to his incorporating of centuries old processes in manufacturing his garments and shoes. I really fell hard for the backpacks, footwear, outerwear and everything in between. The technology may be advanced, but the aesthetic and soul has been around for ages. Also with brands like RRL, there was a complete irreverence (in a good way) to new technology, a stoic commitment to producing an authentic construction AND aesthetic. From the denim, to the leather bags and the colorfast handkerchiefs, everything was 100% inspired by real american traditions. There were other brands that stood out on my radar for other reasons such as NonNative, which produced a solid F/W line but was marred by a nearly impossible availability in North America. Other Japanese brands suffered a similar fate even with the abundance of Japanese Proxies available through the internet. Some important brands that brought strong collections in 2009 included A.P.C., Our Legacy, Yuketen, Supreme, Band of Outsiders and Steven Alan. The only problem with many brands was the similarity in aesthetics this year. The natural downfall to the resurgence of american menswear was the overabundance of classic looks. One could get the same look from any number of companies putting out similar products. It was due to this fact that it became more apparent which brands stood out as being worthy of an investment. 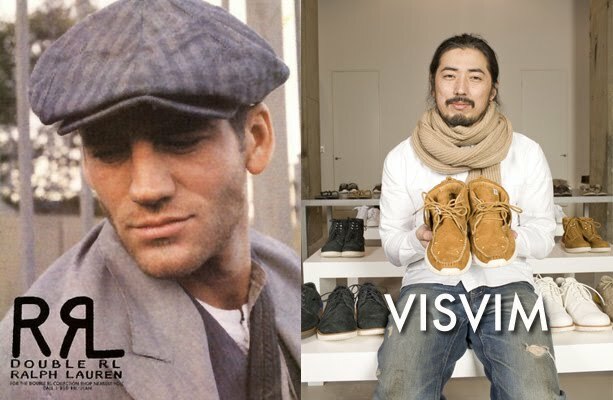 It's because of this that if I were to choose the stand out brands of 2009, I would have to give the honors to RRL and Visvim. They ultimately brought something unique to the table. The source and the inspired. American and Japanese. This is not new, this only seems new to us today. 45rpm crushes the game. Wish I could afford more than a couple of pieces.